Endowed with religious opulence, Bhimashankar hill station is richly enveloped in some ethereal pulchritude of nature and is rightfully termed as one of the popular hill stations in Mumbai. Perched on the elevated height of 3200ft above sea level, the hill station is enshrouded with the sylvan forest and thick foliage of trees. The Bhima River flowing nearby owe its origin to the majestic hills of Bhimashankar and is of primal factor in contributing to the beautification of the place. One amongst the 12 Jyotirlinga Temple, the temple of Lord Shiva is of massive religious significance to all the devotees flocking to this place to seek absolution and is one of the places to see when in the hill station. 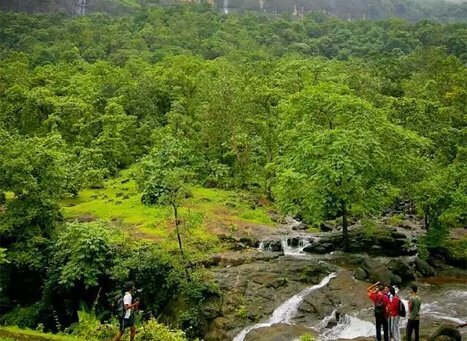 A venturesome trek to the hills of Bhimashankar from Lonavala, is indisputably one of the important tourist activities amongst many. The topmost point on the hill offers you with the breathtaking views of the encircled green valleys and the two serene lakes of Devi and Hanuman besides the sprawling Western Ghats, historical forts and the other spellbinding hill stations. Teeming with an abundance of wildlife and thick foliage of trees, Bhimashankar offers you with a large variety of must visit places. Famous for being home to the original Shivlinga, the Gupt Bhimashankar temple hypnotizes devotes from all across. Recently gaining fame for the Wildlife Sanctuary that developed in this place, Bhimashankar Wildlife Sanctuary brims with a multitude of flora and fauna and is undoubtedly the gateway to nature sightseeing. The group of 30 caves excavated from rocks, the Lenyadri Caves origin dates back to the ancient 3rd-4th century BC and bears testimony to the remnants of religious grandiosity and is one of the important places that is not to be missed out during the Bhimashankar tourism. Fixed in the district of Thane, and sitting pretty amidst the undulating hills the Malshej Ghat offers a beautiful scenic beauty. Witnessing the rare species of birds during the winters is one of the things to do when in Malshej besides the pristine ambience that you get to enjoy. The birthplace of Maharaja Shivaji, Shiveneri Fort is the perfect one day tour destination besides being home to dainty ponds and water cisterns besides the precipitous rocks, and ragged terrains. A dainty hamlet in the Pune district of Maharshtra, Khed Shivapur is a perfect destination for the ones seeking for a taste in rural life. A rich legacy of the bygone Maratha regime, the Jadhavgadh Fort offers for an exotic spa along sides the pool and is a favorite wedding destination for it is one of its kind. Adorned with milky waterfalls, Panshet Dam warrants total recreation for the number of venturesome activities that it hosts including boating on its clear waters. Dappled with tiny temples and shrines and encased with hills and historical forts, Kamshet is home to the famous Pavana Lake and the hills of Shinde Wadi besides being one of the famous weekend gateways. Holidays in Bhimashankar are totally promising favored with rich verdure, grandiosity of pure nature, historical forts, undulating terrains, ancient temples and panoramic landscapes.